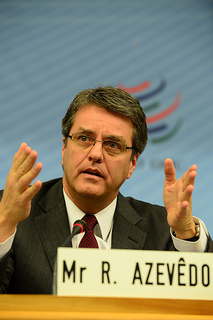 In this column, Roberto Azevêdo, sixth Director-General of the World Trade Organization (WTO), argues that lack of capacity in the financial sector has a very significant impact on the trading potential of poor countries and calls for giving prominence to trade finance in the development debate at a time when the Sustainable Development Goals (SDGs) are being finalised. GENEVA, May 2 2015 (IPS) - Up to 80 percent of global trade is supported by some form of financing or credit insurance. Yet in many countries there is a lack of capacity in the financial sector to support trade, and also a lack of access to the international financial system. Therefore the ability of these countries to use simple instruments such as letters of credit is limited. The impact of these limitations on a country’s trading potential can be very, very significant. After the financial crisis, the supply of trade finance has largely returned to normal levels in the major markets, but not everywhere and not for everyone. The structural difficulties of poor countries in accessing trade finance have not disappeared – indeed the situation may well have declined due to the effects of the crisis. There are indications that markets are even more selective now. Under increased regulatory scrutiny, many institutions have lowered their risk-appetites and are focusing more on their established customers. Some are deliberately decreasing their number of clients in a so-called “flight to quality”. In this environment, the lower end of the market has been struggling to obtain affordable finance, with the smaller companies in the smaller, less-developed countries affected the most. I was particularly struck by the fact that the financing gaps are the highest in the poorest countries, notably in Africa and Asia. And I was struck by the size of those gaps. A survey by the African Development Bank of 300 banks operating in 45 African countries found that the market for trade finance was somewhere between 330 and 350 billion dollars. It also found that this could be markedly higher if a significant share of the financing requested by traders had not been rejected. Based on such rejections, the estimate for the value of unmet demand for trade finance in Africa is between 110 and 120 billion dollars. This gap represents one-third of the existing market. Some of these constraints are structural, and can only be addressed in the medium to long term. The retreat of global banks from Africa, and from other poor countries, is one such issue. The Asian Development Bank conducted a similar survey in Asia, looking at countries like Viet Nam, Cambodia, Bangladesh, Pakistan and India. According to preliminary estimates, the unmet demand there is around 800 billion dollars. Small and medium-sized enterprises are the most credit-constrained as 50 percent of their requests for trade finance are estimated to be rejected. This is compared with just seven percent for multinational corporations. Moreover, two-thirds of the companies surveyed reported that they did not seek alternatives for rejected transactions. Therefore, these gaps may be exacerbated by a lack of awareness and familiarity among companies – particularly smaller ones – about the many options which exist. A large majority of firms stated that they would benefit from greater financial education. These findings are particularly striking as Africa and developing Asia are two areas of the world in which trade has grown fastest in the past decade. But the potential evolution of new production networks is faster than the ability of the local financial sectors to support them. In this way the lack of development of the financial sector can be a significant barrier to trade. It can prevent developing countries from integrating into the trading system and accessing further trade opportunities. And it can therefore prevent them from leveraging trade as a powerful source of development. So we need to respond to this problem. The exchanges that we have here can form part of this response. We need to join together in order to advocate action in this area and to devise practical solutions. Of course, there is no magic bullet. This is a complex issue. However, that should not discourage our efforts. The trade finance facilitation programmes that I outlined earlier are one example of practical action that we can take. Of course this only fills part of the gap, so our response needs to be more fundamental. In July this year, the United Nations’ major ‘Financing for Development’ conference will take place in Addis Ababa. And I think it is essential that we put trade finance on the agenda there. In this way we can ensure that this issue is given its proper prominence in the development debate, especially at a time when the all-important U.N. Sustainable Development Goals are being finalised.